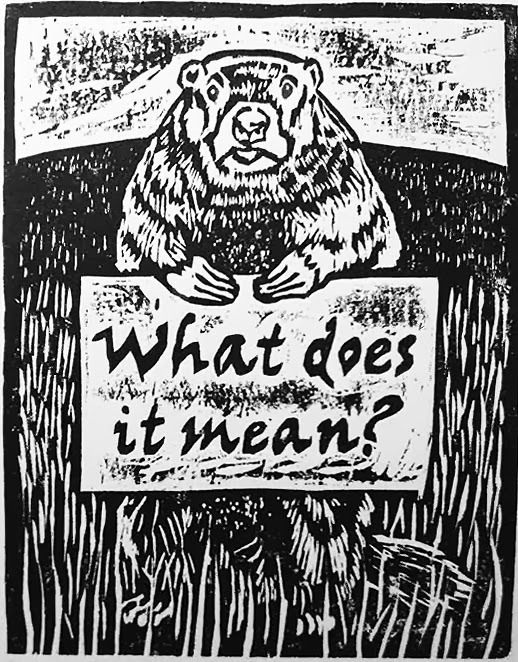 Almost time for Groundhog Day, and as I now live in Pennsylvania, the birthplace of this charming holiday, I have decided to begin an annual tradition of designing a Groundhog Day image to put on greeting cards. Well, if you see your shadow, it's supposed to frighten you back into your burrow, and for some reason this means winter is prolonged. If February 2nd is dreary, you'll not see your shadow and spring will come sooner. (Which is kind of ironic seeing as that if you see your shadow it's a sunny day.) There's apparently some mystery and debate as to exactly how this particular bit of lore started and what it originally meant, which may not matter all that much since it is certainly not how most people would take it today. How they take it today is... er, well, I'm going to have to go with Douglas Adams on that one and say maybe 42?